I thought that it would be important to bring this up once again, the Brain is an extremely interesting organ, and its functions are endless. The capacity to use language to express and understand. The capacity to understand underlying principles as a scientist would, or to manipulate numbers and operations and test possible solutions to problems the way a mathematician does. The ability to represent the spatial world internally in your mind, like a navigator or pilot, a chess player or sculptor. The ability to use the body, in whole or part, to solve problems or to create. The ability to think in music: to hear, recognize, remember and manipulate musical patterns. The ability to empathize with and understand other people. The understanding of self, of who you are, your own strengths and limitations. The ability to discriminate between and classify objects in nature and living things. According to the latest technology, as we grow older, our brains literally begin to shrink. Our reflexes, speech and though processes begin to slow down and our memory is heavily impacted as well. This article speaks about the effects that aging has on our brains. In Cognitive Psychology over the semester we learned how people acquire, transform, use communication through information stored in the Brain. In learning how our Brains function we learn how the Brain is constructed, and how information is stored. A concept I found interesting was the Brains “Plasticity” and how it is able to change, and reorganize itself after damage or build new pathways for information to be stored. It shows how the Brain is resilient, and able to fix itself depending on the type of damage that occurs to it. 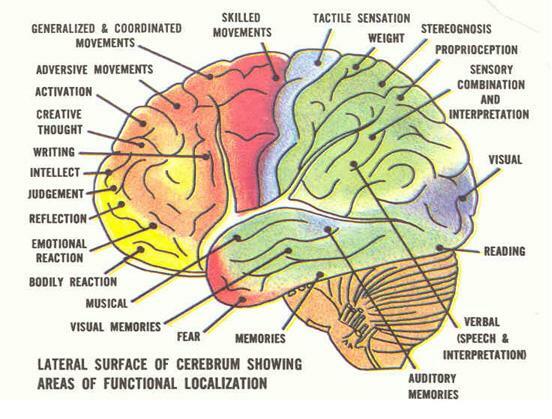 Functional changes occur in the brain, when new information is stored or memorized. Cells such as neurons, glia, and vascular cells are included in Neuro-Plasticity. Another concept I found important in memory was Retrieval Cues which are things that often help trigger us too recognize and recall stored information. “Retrieval cues” can be such things as someone smelling a pie being baked and it reminds them of their Grandmother’s house. In Long-term memory “Explicit” and “Implicit” memories are the two key concepts. In Explicit Memories our memories are consciously encoded, and remembered. While in Implicit Memories are not deliberate or consciously encoded but show previous learning and storage. In “Bottom-up Processing” a person begins with small pieces of information acquired from the environment, and by combining them in various ways they form a perception of something. A persons first response would be them seeing a plate of food, and the content in that plate begin to make their mouth water. This reactions lead to emotion of want, and hunger in the brain resulting in them asking for a plate. In “Top Down Processing” we make meaning of the stimuli by perceiving it, and our expectations of it. I believe memory to be very important in my everyday life, whether it be remembering the route to work, or studying for a test, and recalling important events in my own life. The Brain is important in allowing us to store information, function, and communicate daily. In understanding and valuing these concepts we become better aware of how we function daily. I found a very visual video explaining how a baby’s brain develops. Watch the whole thing, I promise you’ll enjoy it, somewhat. As we all know, the brain of a child continues to develop during the first four years. Development of object permanence matches with peak development of prefrontal cortex. It’s amazing how a part of a baby’s brain contains about 10 thousand nerve cells. Even though their brains starts to develop in the womb, we might wonder how exactly it’s formed. According to this video, the brain begins to wind itself by following a precisely specified genetic blueprint. When a child learns to read, even a single letter set of a complex series of reactions. The brain then starts focusing its attention to on the reading task itself, and then sends visual representations and then it processes until the material gets learned. Children have twice as many connections in the brain than adults. That’s why they’re constantly learning. This video was really interesting to me. Although the title of the video may seem like it only talks about self-conditioning our own brains, it actually focuses more on behaviorism, which is also very important in psychology. The video suggests that learning is the process of acquiring through experience, new and enduring information whether it be through association or simply thinking. I found this video very educational along with other videos of CrashCourse that involves learning about psychology.